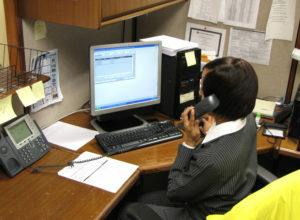 The Complaint Room is the entry point for most felony cases prosecuted by the Fulton County District Attorney’s Office. It is a revolutionary front-end screening system piloted by District Attorney Howard in 2001 and fully implemented in 2003. The Complaint Room is designed to streamline the felony charging process by promoting communication between prosecutors and law enforcement early and often, beginning at the point of arrest (sometimes earlier). After police make an arrest decision, officers contact the Complaint Room to discuss the facts of the case with an Assistant District Attorney. Through this conversation, the prosecutor is able to clarify facts, evaluate a case, request additional information, determine appropriate charges (either by indictment or accusation), or decline to prosecute a case all together. Following the arrest and initial charging decision, Complaint Room Attorneys shepherd cases through all pre-indictment court proceedings from First Appearance through the All Purpose hearing where the Court may: determine probable cause; hold a preliminary hearing, revoke a defendant’s probation; consider bond reduction and/or preside over final dispositions, including pleas and sentencing. The Complaint Room charging protocol replaces the earlier bind-over process which was blamed for case backlogs, jail overcrowding and varied personnel inefficiencies, including prolonged ‘out-of-service’ times for police officers whose appearance was required at court hearings. Under the bind-over process, cases were forwarded to the District Attorney’s Office after a determination was made by the municipal or magistrate court that there was enough evidence to proceed with the prosecution of a case at the Superior Court level. The District Attorney’s Office received the lower Court’s order anywhere from one week to five months after the bind-over decision. Unfortunately, the time frame between arrest to formal charging averaged between 111 and 265 days. The Complaint Room operates under the supervision of a Deputy District Attorney who manages numerous attorneys and administrative staff. The Complaint Room is open 24 hours a day, 7 days a week, 365 days a year.